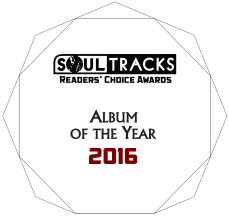 See the Nominees - 2016 SoulTracks Readers' Choice Awards! (October 22, 2016) Okay, this is one election we can all agree on. The time is coming again for the 2016 SoulTracks Readers' Choice Awards, the biggest awards in the world dedicated to independent soul music. We've gathered all the suggestions from readers and our industry friends and have chosen a fantastic group of finalists -- superb artists who represent all that is great about Soul Music in 2016. To be nominated, an artist must have released music (or had the music reach its commercial peak) between October 1, 2015 and September 30, 2016. And all nominees must have released their music independently (i.e., not on one of the three major labels). To make sure the results are accurate and fair, all voting is by individual ballots. Voting ballots will be sent out to all SoulTracks email subscribers on Tuesday, November 1, 2016. If you're already a SoulTracks email subscriber, you're all set. If you're not, you can sign up at the top of this page before that date. It's free and we will never share your email address with anyone else. Antonique Smith - "Hold Up Wait a Minute"
After 7 - "Let Me Know"
Eryn Allen Kane - "Piano Song"
Greg Dean, Chantae Cann, Jarrod Lawson - "Unconditional Love"
Heston - "Mind, Body and Soul"
James Day feat. Trina Broussard and Tim Owens - "Dance Again"
Kindred the Family Soul - "All My People"
Lori Jenaire and Patrice Rushen - "As You Are"
Phonte and Eric Roberson - "Something"
R'mone Entonio - "Without You"
Silk - "Love For You To Like Me"
Tony Momrelle - "All The Things You Are"
Zo! Feat. Joi - "Just Whatcha Like"